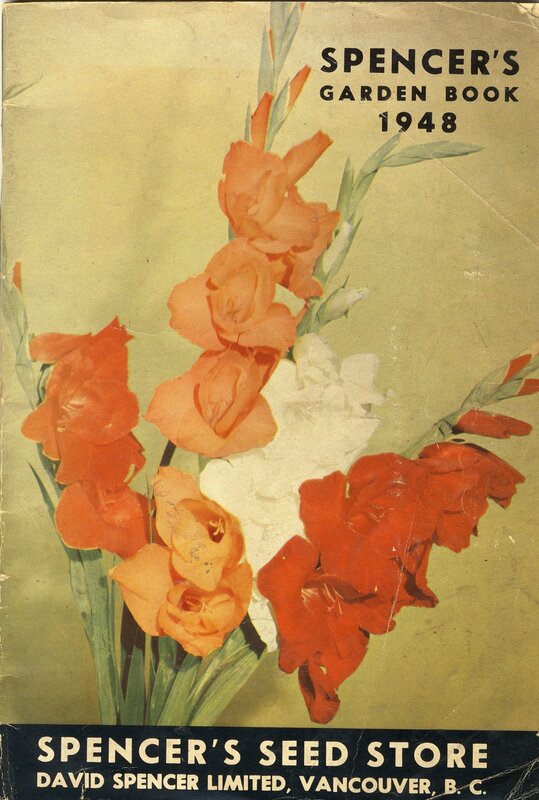 I happened to come across this 1948 Spencer's Seed Store catalogue yesterday in my files and thought - seeds=Spring! And 'Weather' is the topic for this week's Personal Genealogy & History blogging prompt (Week 18 of 2011). We've had much liquid sunshine here all year; that's pretty usual. This year, it's been quite cold, so now this sunshine outside is quite welcome. But this is nothing like 1948 when the lower Fraser Valley near here flooded causing all kinds of damage and destruction, including at least 10 deaths. There was a long period of warm weather that spring, causing heavy snow melts and subsequent flooding in June. Much of the area was cut off from travel or assistance the month as bridges, roads and railways were affected. That's a bit early for me to remember, although I've heard many people talk about the '48 flood. This catalogue is in fairly good shape, although it was obviously well read. Likely it was my mum that ticked off certain choices in the listings - Alyssum-Carpet of Snow, an Annual Cut Flower mixture, Antirrhinum-Maximum, Early Giant Mixed Asters, Asparagus-Plumosus Nanus, and All Colours Mixed Stocks. I wonder what the family garden did look like in 1948. I'm sure there were roses already too, as that was always my dad's favourite flower. And likely a good sized vegetable garden, along with colourful flowers. That's part of Spencer's message to customers for 1948. "....History repeats itself, and we now have the dollar-saving austerity programme which deprives Canada of many of its imported vegetables. ...'Eat what you can, can what you can't and let Canada's surplus go to Europe. While in 1948 we urge the growth of vegetables. In this country of ours, where we can obtain most of the essentials of life even though some are hard to get, food alone is not sufficient for a happy life, one must have beauty, color and fragrance, and where can one find more of these essentials than in a packet of seeds...."
Sadly for Spencer's, 1948 was to be its last year. Founded in 1873 in Victoria, British Columbia, Canada, Spencer's opened its first Vancouver store in 1907. In 1948, the company was acquired by Eaton's.